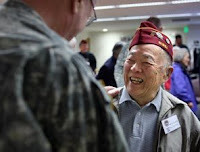 I have mixed reactions to this week's Seattle Times article about our Nisei vets. Densho admires their phenomenal courage, as documented in many interviews in our Digital Archive. Also documented are the insults they suffered upon returning home, like not being permitted to join the Veterans of Foreign Wars because of their racial ancestry. The Seattle Times story about the Minnesota National Guard's 34th "Red Bull" Division honoring the Nisei vets is touching. I didn't know the two units served together. It seems soldiers have a sense of history. But the story's headline is what gives me pause. "Iraq-bound soldiers honor Nisei vets"? As a descendant of Mennonite pacifists, I have to ask myself why yet another generation of Americans is going off to war. War without end?